And now, I will give you a tip to emphasize action in characters: I have forced perspective and enlarged those parts of the body closer to the spectator. In this case, I have enlarged the sole of the foot. 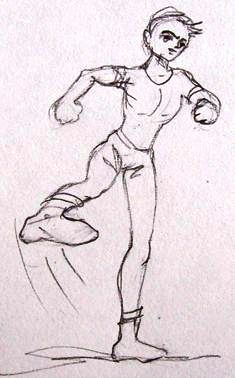 As a result, movement is exaggerated and more expressive. It is all about making the character look like he is popping out of the paper. I will draw another action figure to make my point clearer. 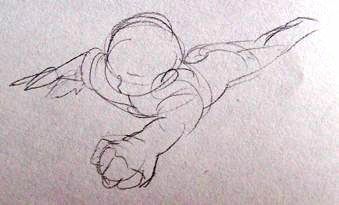 I will draw a flying super hero.